Save BIG on complete small animal setups! Have you been thinking about a new pet for your kids for the holidays? This means that you save on bedding, toys, chews, houses, even food! You won’t find prices like these anywhere else. Not sure what to get? Stop by and ask any associate about our animals and which one might be best for you and your kids. Check out our care sheets here for some basics on small animal care. Discover the CritterTrail Difference over and over and over with the Triple Play 3 in 1 Habitat! This 3-in-1 cage comes with everything you need to create three different challenging environments for your pet. Choose between the arch, tunnel or tower designs. Introducing new layouts will challenge and mentally stimulate your pet, and help with muscle development. The Triple Play Habitat also comes with a food dish, water bottle and exercise wheel. Top and Front wire doors allow you to easily access your pet at any time. 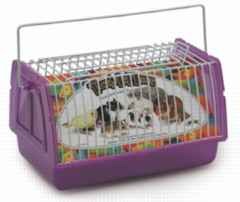 Ideal for mice, dwarf hamsters, hamsters and gerbils. · Improved detachable design makes assembly easier and cleaning a breeze! Perfect for guinea pigs, hedgehogs, and rabbits.